A Related Results panel uses a display template ASCX file to define what is rendered inside the panel. Coveo .NET Front-End comes with a default display template file for out-of-the-box .NET search interfaces ( [.NET_Front-End_Path]\Web\Coveo\Skins\[Interface_Name]\RelatedResultsDisplayTemplate.ascx), excluding mobile .NET search interfaces. You can duplicate and customize this file to create other display templates by modifying controls they contain add scripts to modify their behavior (see Creating or Customizing Related Results Display Template Skin Files). 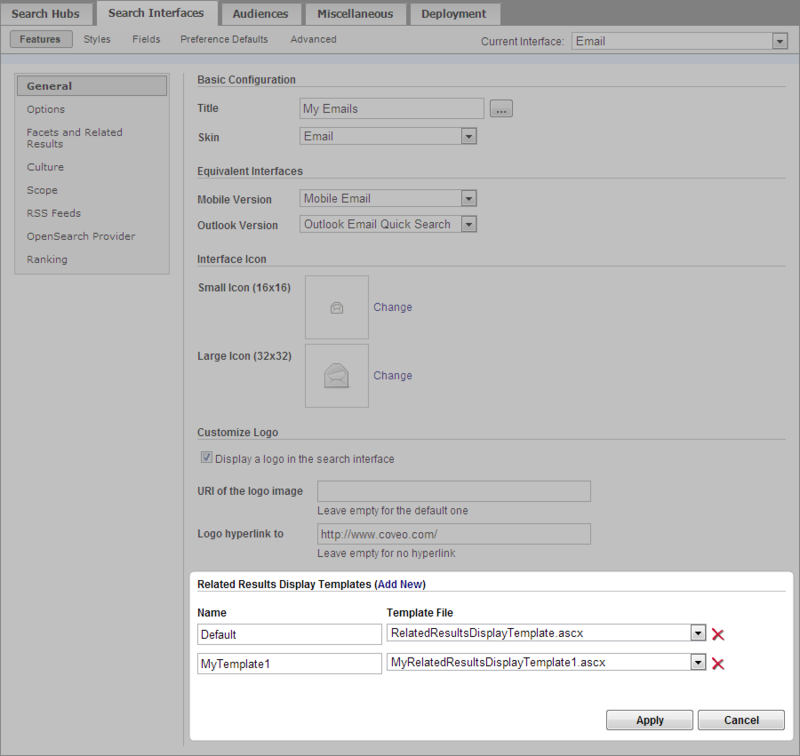 Once other display templates are available, you can use the .NET Interface Editor to add a display template to a .NET search interface so that it becomes available when you add a Related Results panel for this .NET search interface in other search interfaces. In the Current Interface drop-down list, select the interface to which you want to add Related Results display templates. Next to Related Results Display Templates, click Add New. In the Template File drop-down list, select the desired template file that you want to make available. Note: The files that appear in the Template File drop-down list are the Related Results display template files that are currently available in the skin folder for the currently selected interface. You must create new template files in this folder before you can select them (see Creating or Customizing Related Results Display Template Skin Files). In the Name box, enter a name to identify the selected Related Results display template file. In another .NET search interface, select this display template when you add a Related Results panel for this .NET search interface (see Adding or Customizing a Related Results Panel With the .NET Interface Editor).